West Papua borders the independent nation of Papua New Guinea and forms the western half of the world's second largest island. 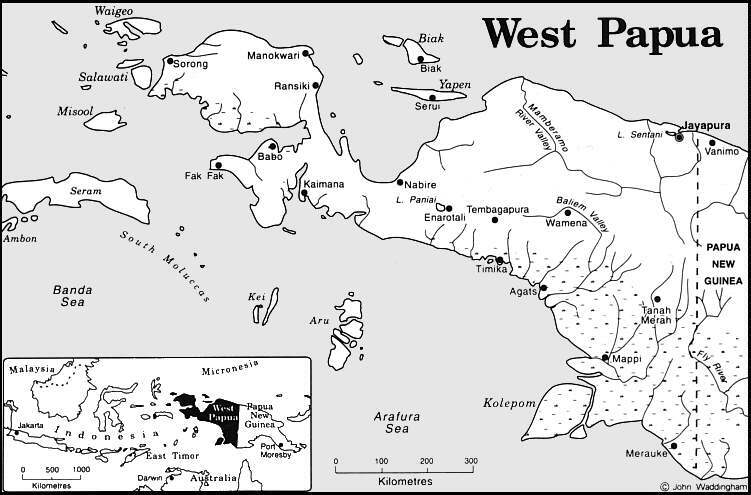 West Papua became the twenty-sixth province of Indonesia in 1969 after the so-called "Act of Free Choice", sponsored by the UN, saw the transfer of official administration from The Netherlands, the colonial power, to Indonesia. The province was in 1973 re-named Irian Jaya, "Victorious Irian", by the Indonesian President, General Soeharto. The indigenous movement rejects this name and identify themselves as West Papuan. Resistance to Indonesia had begun in 1962 when temporary authority was first given to Jakarta, and continues to the present. Over the twenty six years that Indonesia has held official control of West Papua, the indigenous population has endured one of the twentieth century's most repressive and unjust systems of colonial occupation. An on-going war has been fought against a popularly supported indigenous movement opposed to Jakarta's rule, and against members of the civilian population who stand in the way of Indonesian "development". An escalation in killings recently, especially around the massive Freeport copper and gold mine in the central highlands, has been widely reported in the Australian and international media. The indigenous people of West Papua are of the same ethnic origin as those in the eastern half of the island of New Guinea and are also related ethnically and culturally to other Melanesian peoples of the Pacific. Yet under the Indonesian government's Transmigration program, the indigenous West Papuans are being reduced to a minority population due to an annual influx of over 10,000 families of sponsored migrants from Java and Sulawesi and an unknown number of "spontaneous" migrants. The widespread appropriation of land for new settlements, forestry concessions, mining projects and farming has led to numerous large-scale conflicts between the Indonesian military and dispossessed tribespeople, particularly in the late 1970s, 1984, and again in 1990-92 and 1994-95. Indonesia does not regard the West Papuan people (or other communities) as indigenous and subordinates adat (traditional) law to the national interest. This denies a fundamental feature of West Papuan life and identity, viz relationship with the land, leaves the West Papuan people fundamentally defenceless in the face of development and transmigration policies, and absolves Indonesia of any obligations under international instruments and mechanisms. "The Charter of the United Nations, the International Covenant on Economic, Social and Cultural Rights and the International Covenant on Civil and Political Rights affirm the fundamental importance of the right of self-determination of all peoples, by virtue of which they freely determine their political status and freely pursue their economic, social and cultural development."